An exciting event for students interested in international and domestic education experiences. 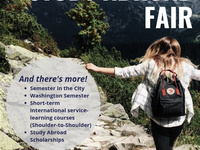 Students will have the opportunities to learn from representatives from Lasell’s over 75 semester study abroad programs, domestic programs, such as Semester in the City and Washington Semester, and the international service learning courses called Shoulder-to-Shoulder programs. Student will also be able to learn about study abroad scholarships, internship opportunities, upcoming cultural events on campus, and more! The Office of International Services and Global Ambassadors (returned study abroad students) will be there to share their experiences and answer questions.